Perhaps because of their size and method of distribution, they do not appear to be widely found or collected within the UK. Details of this issue, is of course, to be found in the World Tobacco Issues Index, though, as this article will show, the information is somewhat limited. Although the World Tobacco Issues Index (WTII) does give a broad indication of the various groupings, there is no checklist of subjects. This is not surprising as although the majority of cards are numbered, there is both a duplication of numbers and subject varieties, making it very complex for the new collector or casual observer. 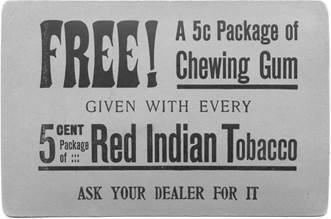 Became branch of American Tobacco Co about 1892. 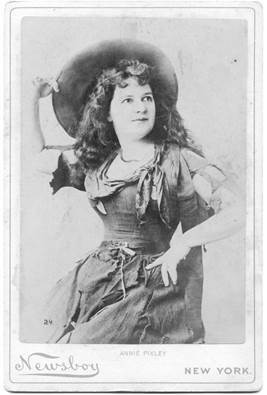 Cards issued about 1890. Premium issues, exchanged for tags or coupons. Pictures mounted on thick board inscribed at base “Newsboy ….. New York”, without reference to tobacco. 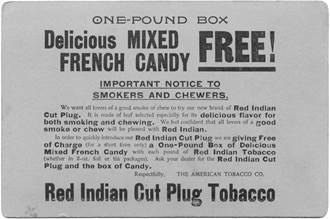 “Newsboy” was a brand of plug tobacco. CABINET PICTURES (A) Corners rounded. Mostly actresses but including actors, celebrities and scenes. There are many faded captions and numbers. Ref USA/566-7. Pictures black and white or sepia photos. Size about 165 x 105, Nd. (1) Number only on photo, number and caption on mount. Mostly Actors and Actresses, including some Celebrities, Athletes, Baseball. 1. Nos 1/136 Each number with one caption, many with two, three or four pictures of the same subject. “Newsboy – New York” in red on white mounts. About 20 are known unnumbered. 2. Nos 301/385 “Newsboy – New York” in green on grey mount. 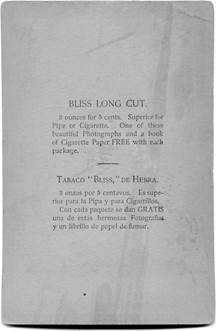 Back (a) plain (b) with wording in English and Spanish headed “Bliss Long Cut” (c) with wording “Red Indian Cut Plug Tobacco”. 4. Nos 800/841 “Newsboy – New York” in red on white mount. (2) Number and caption on photo, not on mount. Nos between 1/227 known, including Actresses, Actors, Views, Warships. “Newsboy – New York” in red on white mount. 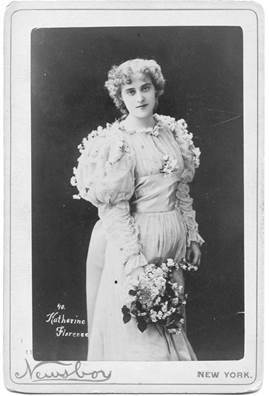 Same mounts as in (1) used captions covered by photo. In some cases former captions or numbers are visible but should be disregarded. Coloured halftones. Size about 230 x 150 “Newsboy – New York” in brown (100). I think you will agree the above details are quite complex and I hope by the conclusion of this article to identify and simplify the main groupings, hopefully to the benefit of other collectors or the interested observer. Almost by accident I acquired a batch of these cards some years ago and was immediately impressed by the strong images, size and stoutness of board and the challenge of the series. Before long I became a victim of ‘stealth collecting’ as I was blissfully unaware of the number of photos I was acquiring. Eventually I had to decide whether to call a halt or to specialise in this series, which in effect became a long term research project. I have now acquired or seen sufficient examples of “Newsboys” to be in a position to classify them into possibly more user- friendly groupings. More importantly a workable checklist of subjects has evolved which, although far from complete, will enable other collectors to compare their cards and hopefully fill in the gaps as well as spotting the inevitable errors, which will have crept in. Working on a volume basis, 3 main groupings and 4 minor groupings have emerged (setting aside the known set of 100 coloured half tones 230 x 150). Now to business: The first and arguably the most confusing group, has the subject title in upper case and always on the mount. The photo will be numbered but this may be on the mount, or the photo itself, or both. If on the mount, it will usually be on the left hand side. The word Newsboy will be in red, also on the left hand side of the mount and the words NEW YORK also in red but on the right hand side of mount and in capitals. The size and style of the word Newsboy can vary in the manner of the words ‘Guinea Gold’ (British series issued by Ogdens) but in the interests of my eyesight and sanity I have not attempted to classify the many variations, which probably exist. The backs of the cards were intended to be blank but isolated examples will be found where enterprising retailers have put their own advertising on the back. The highest number in the first grouping in the WTII is 136 (William McKinley for the record) and, unlike the other, groupings which follow, is the highest number I have come across. (Martin Murray has a variety of card 108 numbered 198, which may be some sort of printing anomaly). It should have been a relatively straightforward task to compile a subject checklist, however, as the WTII indicates, many numbers have different pictures of the same subject. The WTII records up to 4 different pictures but so far I have found two numbers with 6 different pictures and another with 5. If this occurred for every number, the total for this grouping would be staggering, well 816 cabinets actually. And, of course, we do not know if six is indeed the maximum. It is open to conjecture whether the compiler of the series worked to an organised plan or responded to the popularity of the subject or output from the photographer involved. I suspect the series evolved on a random basis, rather than a deliberate pre-planned marketing exercise. These cabinet photos are sometimes described as ‘albumen photographs’, which refers to the photographic process prevalent at the time. The abbreviations used when describing the ‘pose’ of the subject follow the Guinea Gold Reference Book ie F refers to ‘full length’, H/S-Head/Shoulders etc, etc. A number of identical subjects can be found in the various groups and I have endeavoured to provide a cross reference with the corresponding number in brackets after the subject’s name. (NB the letters UC & LC after the ref. Number, indicate Upper/Lower Case, ie, groups 1 & 3.Some UC examples may also have a further number after a ‘forward slash’ to indicate which ‘picture variety’ is involved. UPDATES TO WEBSITE 1St March 2015 New subjects/portraits/variety/corrections indicated by * in front of number. NB The above refers to a variety in lower case. F, L HAND TO MOUTH, HAT, TIGHTS. *also seen with GLADYS WALLIS crossed out. The next group is easy to identify, having the words Newsboy/New York printed in green on a greyish board. The photo itself is mounted within a double set of frame lines, also printed in green. The inner frame line is thinner than the outer. I believe (but am open to correction) the technical term for these photographic prints is ‘silver gelatin’. Arguably this process results in a sharper, more defined end product than with all the other groupings, and may account for the slightly higher prices when sold. The photos are numbered on the mount, and apart from one example (306 on RH side), always in the centre. The photo may also bear the number, either on the right or left hand sides. The printing of the words New York can also vary (see illustrations below). Most examples will be in block capitals ie the usual version but occasionally in a smaller stylised version beginning with a capital letter, the remainder in lower case. Examples of the same number in either version have been seen. 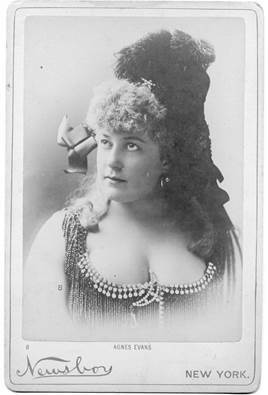 A great number of the subjects in this grouping were taken by the renowned New York society photographer Benjamin J Falk and his copyright wording often appears on the mount beginning with the year 1888 through to 1894 though it is likely this grouping would have been issued after these dates. Mr Falk also had his copyright stamped on the photo in the manner of a cartouche. 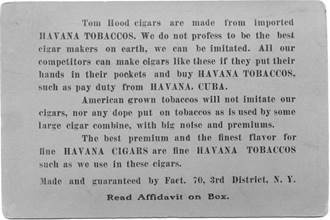 (e) Tom Hood cigars are made from imported HAVANA TOBACCOS. 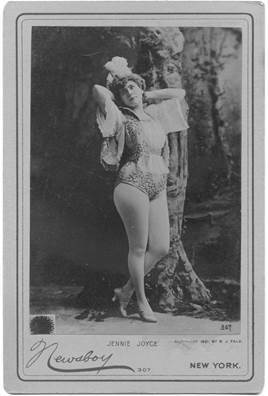 One strange feature, for which I have no explanation, but which I have found is common to almost all photos with an advertisement on the reverse, is that the image is in sepia or brown, as opposed to the usual black and white. It is not clear whether each number can be found with an advertisement back, but as those photos with an advertisement are very much in the minority, I think not. The numbering of this group commences with 301, and to date the highest I have come across is 390. Until recently I was convinced there was only one subject for each number but recently I came across three numbers with two entirely different subjects, (308/309/319 – see index). I can offer no explanation, as the names and numbers are clearly printed on the mount thus discounting the possibility of the wrong photo being attached. The third of the three major groupings of Newsboy cabinets has the same numbering as the first grouping, and in consequence, if referred to by number alone, can easily be confused with that group. The words Newsboy and NEW YORK are in red and the photo is within a single red frame line. The main difference involves the subject caption, which is in lower case and always on the photograph as is the number. (NB a very few exceptions occur on photos depicting objects eg buildings or scenes where examples have been seen in both upper and lower case) The captions are often very faint, printed either in brown or white thus often fading into the background. *Unlike the complexities of the first grouping, each number has a unique picture but as stated the numbering is the same ie commences with number 1, with the highest recorded number at 1065 (but see note re. 1376) However as can be seen there are huge gaps in the numbering from 233 upwards for which I have no explanation other than the possibility of a ‘master’ numbering series used by multiple studios but principally NEWSBOY. Arguably this is the most interesting of the three groupings for, in addition to the vast numbers of theatrical subjects which predominate groups one and two, it includes a number of views, buildings, bridges, warships and sportsmen, the most sought after, being, of course, the ten baseball subjects. Little is known of the production of these ‘cabinets’ but they were obviously mass-produced in view of the numbers and variable quality. The mounts were printed with the photos being pasted on sometimes leaving traces of glue around the edges of the photo. Mention is made in the WTII of known examples with trace of a different name on the mount compared with the name on the photo. I suspect that the first issue was in fact the first grouping where the subject name was printed on the mount and the appropriate photo added. Later on, when preparing the third grouping, spare mounts from the first grouping were used, relying upon the operative to cover up the name on the mount if it differed from the subject photo being used. CASTLE GARDENS & BAY N.Y.
Ida Rock, Alice Branson, Geraldine McCann. Statue of La Fayette, Madison Square N.Y. The Terrace, Central Park N.Y. US Post Office Department Washington D.C.
As a rough estimate, I would say the first three groups would account for 90% of the Newsboy cabinets I have seen. This brings us to the remaining five groups, which are much smaller and in two cases contain less than a handful of cards. Cards in these subsequent groupings can be recognised by the number and its relative position on the mount, the colour of the wording and number of frame lines.. The fourth and largest of the remaining groups could be entitled the ‘500’ series as most of the numbers are in the 500’s, the lowest I have seen being 501. The most obvious feature of this grouping is the double frame line that encloses the photo. The frame lines are of different thickness, the inner line being narrower than the outer. They may also be coloured either red or purple/brown as are the words Newsboy, NEW YORK, the number and name of subject. The cabinets are numbered either centrally or on the right hand side of the mount. Curiously, where a number appears on the photo the ‘500’ part is sometimes missing so number 502 on the mount becomes just 2 on the photo. The same subjects would appear to be available in either ‘red’ or ‘purple/brown’ printings. Identical subjects can be found in either groups one and three. I believe all the photos are printed using the ‘albumen’ process. The backs are blank and the highest number I have seen is 604 (Della Fox). 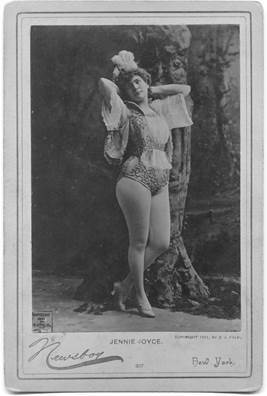 As with the third group, the subject’s name is in lower case.